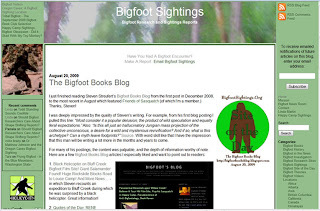 Believe It Tour on the Road to Bluff Creek, We Almost Lost Woolheater, Squatching Brush Mountain; Bigfoot's bLog Is BIGFOOT SITE OF THE DAY! 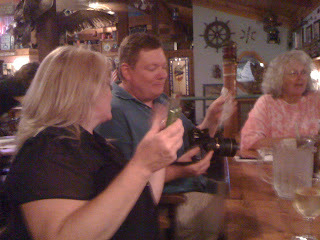 (see their awesome photo collection on Flikr here: http://www.flickr.com/photos/believeit/, with more set links below covering their visit to Bigfoot Books, some fine dining, and the venture out to Bluff Creek), along with Texan Craig Woolheater, Sharonlee Lormuno of Bigfoot Field Reporter (blog at: http://www.bigfootlives.blogspot.com/, show at: http://www.talkshoe.com/tc/59501), Linda Martin of Happy Camp's Bigfoot Sightings (http://bigfootsightings.org//), and James Bobo Fay with his friend, Jimi "Slash" Frizzell. represented on this California 2009 leg by Mike Esordi of Connecticut, Diana Smith of Grand-View-on-Hudson New York, and Brad Pennock (wait, where does he come from?). The Believe Its came on up from San Diego, seeking ghosts out in the desert, and finding Paul Bunyan on the Humboldt/Del Norte coast, and then came on inland to visit us. We looked for bigfoot both in the wild and in history while they were here, and they went on north along the BIGFOOT SCENIC BYWAY (see rare signed poster to left) on their way up to find Lemurians and possibly Extraterrestrials up on Mount Shasta. 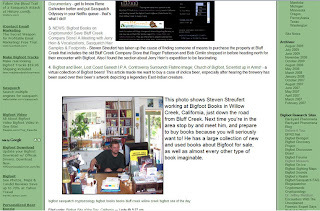 Read their blog on this part here: http://we-believe-it.blogspot.com/2009/08/bigfoot-country-is-off-grid.html. But first, let us toot our own horn again and get it over with. 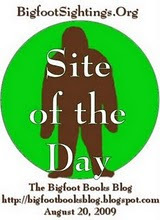 Today Bigfoot's bLog was named THE BIGFOOT SITE OF THE DAY by Linda's Bigfoot Sightings website (http://bigfootsightings.org/2009/08/20/the-bigfoot-books-blog-bigfoot-site-of-the-day/)!!! Well, we are surely humbled by statements such as this, but we do TRY: "I was deeply impressed by the quality of Steven’s writing.... With word skill like that I have the impression that this man will be writing a lot more in the months and years to come." OK, a book is in the mental pipes, but we're not exactly taking orders yet, and the more we look the stranger the possibilities become. The first night involved dinner at CINNABAR SAM's. 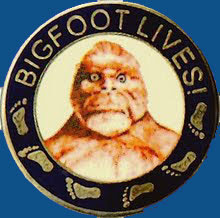 I have to say, Bigfooters are often an outdoorsy form of nerd. I have never been so photographed, videoed, documented, recorded and questioned in all my life, and moments later it is Tweeted, then blogged, Flikred, then immortalized on their web site. 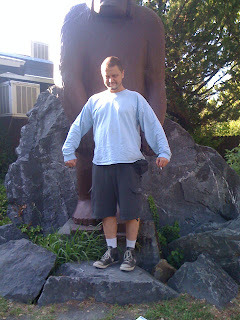 Documentarians at heart, Bigfoot people will prove each others' existence if they cannot get the Big Hairy One on film. They do love their tech gear! Everyone is instantly famous. (see our previous post HERE). We had a third-gen night scope and a very cool new thermal imager so refined that it presented clear as day images in a moonless pitch dark. No Squatches made themselves known, but we did encounter some raccoons, acorns falling from trees (and one bigger thing, potentially a tossed rock), and some amazing views of straggler Perseid meteors and the Milky Way (which is astonishing through night vision binoculars!). 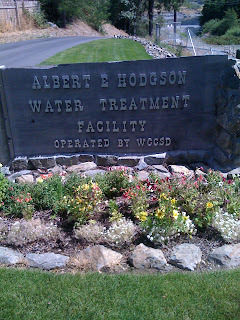 The next day was a trip out, as is said, "On the Road to Bluff Creek." Think of "on the road to Loch Ness," a British expression, and translate: CRAZY! Nutso? Off the deep end? Well, maybe we are? On the way the expedition stopped in at the BLUFF CREEK COMPANY. The store building was standing still. We were shortly visited by owner Phil Smith Sr., though, and found out that he plans to tear the store down by October. And this: the asking price is actually around $600K. But still, what a deal! One can see how the building is deteriorating, but the owner assured us that it could be restored--it just isn't in his plans to do so. Apparently, the BC Company has no phone, and the property is not on the public market yet, so anyone wanting to save the place must act more or less NOW, and will have to go to the site to inquire. After lunch at the Orleans Mining Company Diner, where we saw many hundreds of iron skittles (and painted saw blades) on the walls, and a two-headed calf, we headed out on the G-O Road (EyeSee on the sign) up to 12N12/Cedar Camp Road. Below, the turnoff to the Film Site, and... the Believe It folks get their first baptism in the sacred waters of the film site area of Bluff Creek. Round the "big bend of the creek" spoken of by Bob Gimlin is the FILM SITE, at the bottom of the now-signed 12N13H. More on this in our next post. Here Diana and Mike investigate the film site itself, just upstream from the big bend and huge root balls of Douglas Firs. NEAR DISASTER! GORY DEATH AVOIDED! For those who might be thinking of going to the Film Site, TAKE HEED! BEWARE! A four-wheel drive vehicle is highly recommended! Not kidding: Craig Woolheater and Crew nearly ended up as Bigfoot and Salamander food, with their truck hanging precariously over the creek below. The rock slide at the bottom of the hill can be treacherous, and on top of that, there is nearly no way to turn around once heading down the road. So, be careful! Read the story HERE and HERE, and see the images HERE. In Willow Creek everything is "Squatchy." Here we have famous bigfoot godfather Al Hodgson immortalized by a recently revamped municipal water system drawing water from Willow Creek aquifers just before the creek reaches the Trinity River. He's still living, and will always be a Legend. 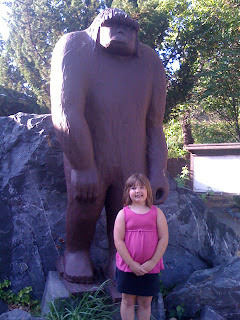 Here are Denali and her Dad having some fun "messin' with Sasquatch." OK, well, all for now. We will have to put the P-G FILM SITE UPDATE in a separate post. For now I will say: WE WALKED IN PATTY'S FOOTSTEPS! Here are the relevant FLIKR PHOTO SETS taken by the Believe It Tour folks. Check them out, they're grrrreaaat! 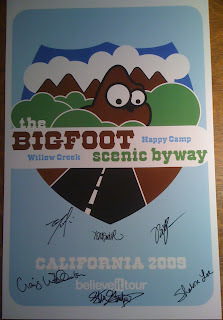 Links: WILLOW CREEK AND BIGFOOT BOOKS, BLUFF CREEK JOURNEY, and THE FILM SITE. Oh, and I almost forgot. THE CHURCH OF BIGFOOT also visited this weekend. A fun night celebrating beer in Bigfoot's riverside domain was had by all. Image here, from The Believe it Tour.